On Monday, the Federal Reserve’s Senior Loan Officer Opinion Survey on Bank Lending Practices was released to the Heads of Research at the Reserve Banks. Though we are not among the addressees, as loans are the fuel that makes the economic machine hum, we like to listen in. For businesses, standards were broadly easy and demand relatively good. Commercial and industrial loan standards and terms eased for firms of all sizes while real estate standards were unchanged. For demand, small businesses were at the vanguard, with banks reporting stronger demand for C&I loans. While demand was caused by the reasons one might expect, i.e. inventory increases, equipment, M&A financing, etc..., banks who reported a decrease in demand cited a couple of interesting reasons. First, borrowing may have shifted to other lenders, implying increased competition, which was further indicated by many banks reporting that they decreased the spread between loan rates and their own cost of funds. Second, some companies may no longer need loans as their financing needs are being met by “internally generated funds”. 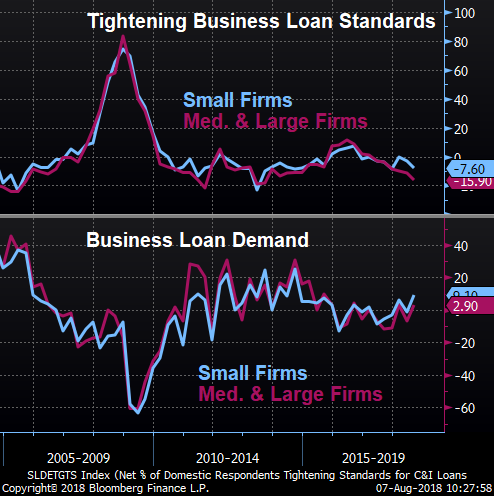 Going straight to the horse’s mouth, the NFIB SBOI survey from last month further supported the view that loans were easy to come by, with Loan Availability the best it has been since 2004. This data hints at a potential weakening in home sales, and while Revolving Consumer Credit grew 4.0% YoY, the month on month numbers were negative for a second time this year. Time will tell if this labor tightness will spur further increases in wages and or becomes a drag on production. P.S. While we might add “BoJ Rumors” to Mark Twain’s triumvirate of “Lies, Damned Lies, and Statistics”, a Reuters article released Monday whispered that there may be a change in the winds at the BoJ, even mentioning that plans to raise rates had been on the table earlier this year. What a change that would be!